Holy Cross sophomore libero Daisy Flores made 29 digs against Victoria St. Joseph. Holy Cross sophomore libero Daisy Flores made 12 digs in the victory over Victoria St. Joseph. Victoria St. Joseph (35-2, 11-1) has been the giants in what is now TAPPS District 4-4A, but the Flyers were slain by Holy Cross (29-13, 10-1) Sept. 30 in Victoria. It was the Knights’ first win over the perennial district champions, who have reached the TAPPS state finals each of the last two years. Holy Cross not only handed St. Joseph its first district loss since 2012, but won in three games: 25-14, 25-19, 25-20. In fact, the Flyers hadn’t lost a game in district play in the last two seasons. St. Joseph was No. 1 in the MaxPreps TAPPS 4A rankings and No. 3 in their TAPPS overall rankings. The loss ended a 20-match winning streak. Henrianna Ibarra (14 kills, 18 digs) and Victoria Gonzalez (7 kills, 8 digs, 3 blocks) each served four aces for the Knights. Anna Zuniga (17 aces, 9 digs, 1.5 blocks) chipped in three aces. Daisy Flores contributed 12 digs and Stella Ramirez had eight. Kimberly Butcher dealt nine assists. Megan Hernandez added four kills. 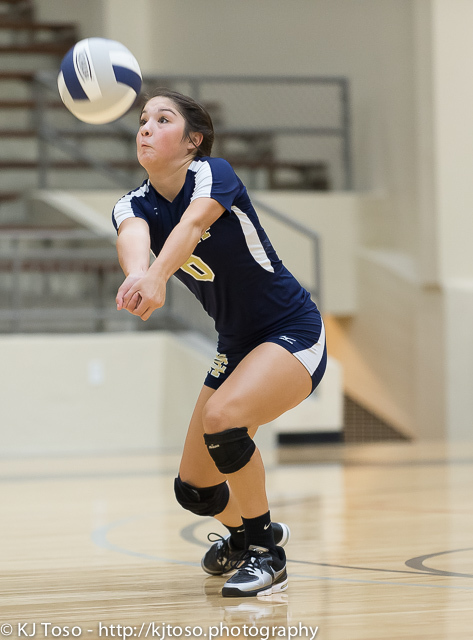 Holy Cross also defeated San Antonio Christian 27-25, 25-17, 25-19 Oct. 2 at Holy Cross. Ibarra led with 19 digs and 17 kills as the Knights recorded their sixth-consecutive win. Butcher distributed 12 assists. Flores served four aces. Gonzalez made four blocks. The Knights are utilizing Butcher and Anna Zuniga as their setters in a 6-2 alignment.